Scouring the lists of exclusive merch at SDCC is both exhausting and mouth watering. On the one hand, there is so much of it, and on the other hand, so much of it is so good. 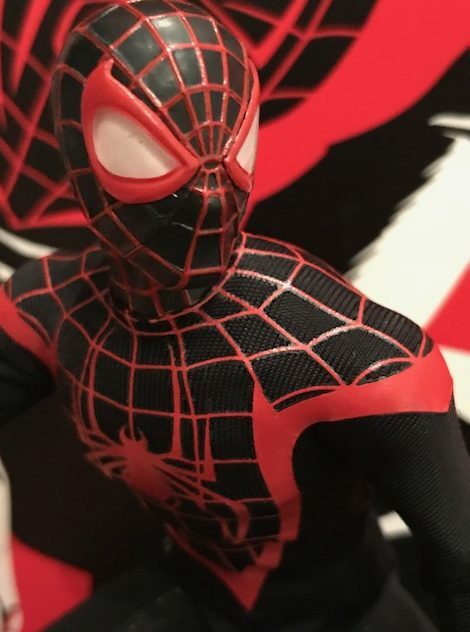 Part of that SO GOOD is this year’s exclusive offering from Mezco’s One:12 line: Miles Morales – Spider-Man. Within minutes of pre-orders going live, I had my order confirmation. 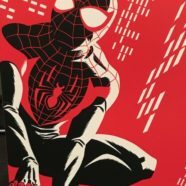 I love Miles Morales. There was no way I was missing out on this figure. Mezco shipped the figure rather quickly. Yes, I did have to wait until after SDCC to receive it, but I was surprised with how fast it arrived after SDCC ended. The greatness of this figure starts with the box art. That is some sweet Michael Cho art adorning this box. I will definitely be getting this box signed by Michael Cho if I ever get the chance to meet him at a con or store signing. The image looks so cool. This figure is a lot of fun. 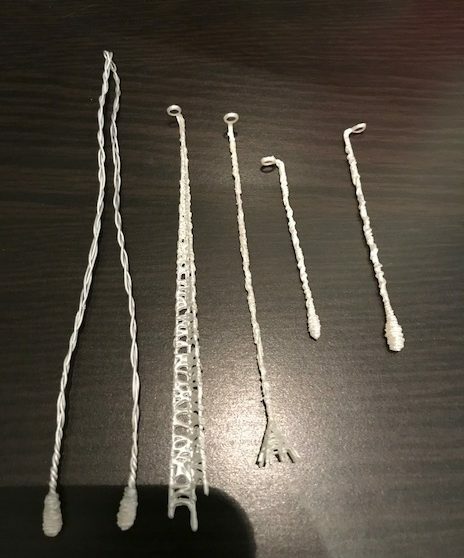 Mezco included five different styles of webbing. 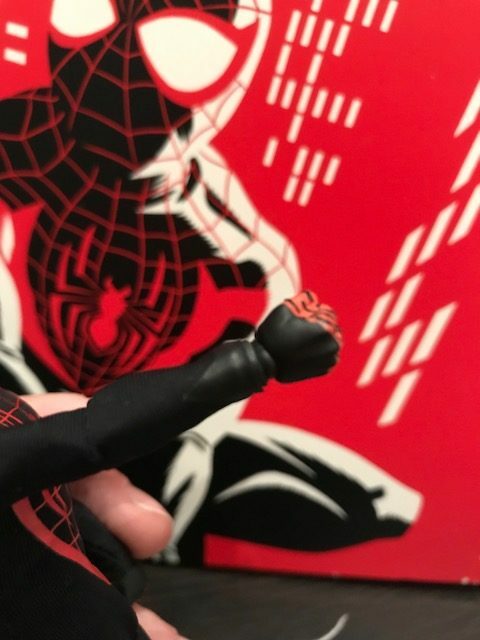 The webs fit between the hand and the arm of the figure. Pop a hand off, place the webbing’s ring on the arm, and pop the hand back on. 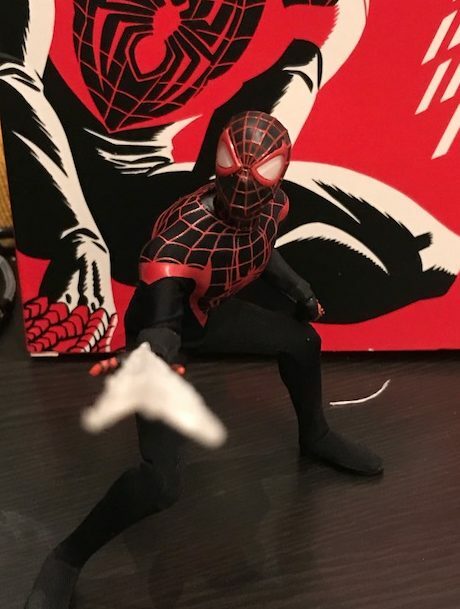 It sounds easy, but honestly, it took me a few minutes of trying to get the hand and webbing to stay on the figure. But once it’s on, it looks fantastic. The attention to detail on these One:12 figures is amazing. Check out this arm. See that area right by the wrist, where the fabric arm sleeve ends? There’s a little bit of plastic on the fabric there, making the transition from the fabric sleeve to the plastic fist very nice. It looks like a glove extending from Mile’s hand, but it’s all part of the sleeve. Plus, just that level of detail, even being black on black, really stands out. My only quibble with the figure is that it only has one head sculpt included. 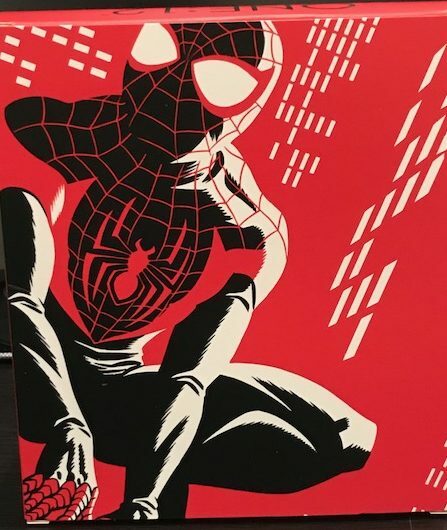 I would have loved an unmasked Miles head or even a half-masked Miles head (think the Marvel Legends Pizza-eating Spider-Man). But that quibble comes from being spoiled by Mezco’s One:12 line in the past. They’re usually so generous with two to three heads per figure, that only getting one (admittedly gorgeous) head seems like a letdown. It’s a small letdown compared to the majesty that is this figure. 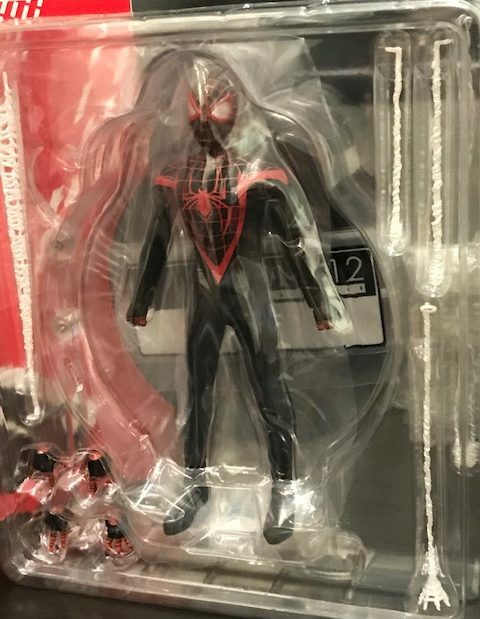 If you are a Miles Morales fan, you need the Mezco One:12 Miles Morales Spider-Man!